Students enrolled in medical school may want to consider a clerkship at the University of Washington Department of Anesthesiology & Pain Medicine. The department maintains an active program of teaching and research for both the specialist and non-specialist. Medical students are introduced to the principles of anesthetic management and the effects of anesthetic agents on circulatory and respiratory physiology. An anesthesiology clerkship with the Department of Anesthesiology and Pain Medicine will introduce medical students to the comprehensive perioperative care of patients provided in the context of anesthesia. 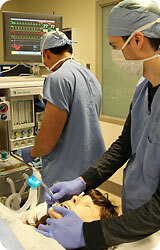 The basic and advanced electives focus on the intraoperative and immediate perioperative care of patients. The clinical-clerkship program in anesthesiology provides basic training in airway management and care of the unconscious patient. This is a valuable educational opportunity not only for those students who are considering anesthesiology as a specialty career path, but also for those who want to develop practical skills and knowledge that can serve as a foundation for practice in other specialties. The pain medicine curriculum for medical students offers students the opportunity to learn the function of the Pain Consultant in the rapidly expanding subspecialty of Anesthesiology, Pain Medicine, through participation as part of a team in evaluation and management of patients experiencing short-term post-injury (surgery, trauma) pain and/or long-term pain. Students will have the opportunity to learn the principles of an interdisciplinary approach to pain management in both inpatient and outpatient settings. Acute, and especially chronic pain, are very significant problems for patients, their families, their work places, the health care system of delivery and payment, and for doctors of all specialties. Medical management of chronic pain involves all medical, surgical, and behavioral specialties, and has an especially large impact in primary care. 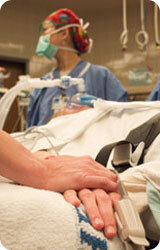 AIG UWSOM is the medical student Anesthesiology Interest Group at the University of Washington School of Medicine. 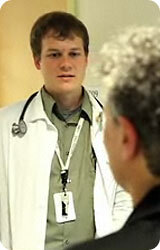 AIG was organized by and is run by UW medical students with help from dedicated anesthesiology faculty members. The site is committed to providing up-to-date information, resources, and events to help medical students explore the field of Anesthesiology. The University of Washington Department of Anesthesiology and Pain Medicine maintains a link to AIG UWSOM, but does not control or sanction the content at the medical student site.